For bloggers, as people who are often plugged in, absorbing information, writing and interacting online, etc – how blessed a day of reflection can be! I think this was a common sentiment for all of us that attended the ATX Catholic Day of Reflection last weekend. Speaking for myself, it was a great gift to unplug for an entire afternoon, and “plug into” the silence of that gorgeous hill and silent Shrine – and into the living dialogue of community. 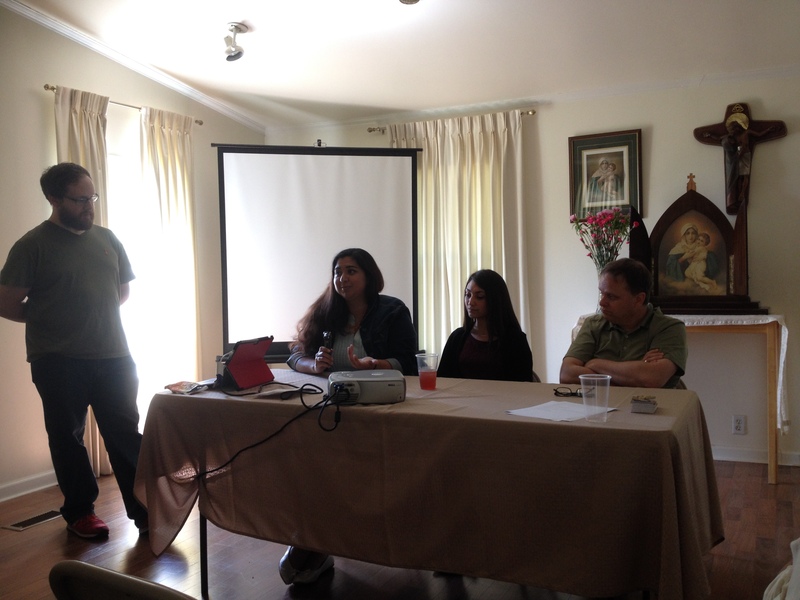 One of our Panels, on Catholic Life Online Today, Featuring Laura Gonzalez, Cristina Alamanza and Steve Scott. Moderated by Cristobal Alamanza. Quick Take #1 – Community. I think these periodic face to face community events are what makes ATX Catholic a little bit different from other blog groups, and a little bit unique. Being a community that is primarily connected to each other online, we have seen and known how rich it is to interact off-line and build our bonds in person. This Day of Reflection was just one example, we also have Quarterly Meet ups and lunches, and our Board makes an effort to regularly meet face to face, often by breaking bread together. This weekend, I thoroughly enjoyed the lively conversation with many of our contributors – Cristobal Alamanza, Steve Scott, Trenton Henrichson, Cristina Alamanza, Brandon Kraft – just to name a few! I highly suggest you check out the podcasts from the day, and I welcome your comments on any of the presentations. Quick Take #2 – Taking a time out. I kinda mentioned this before, but I wasn’t the only attendee with this take-away. As several of us stood chatting outside the Shrine after mass, we shared about how much we needed this day of renewal. 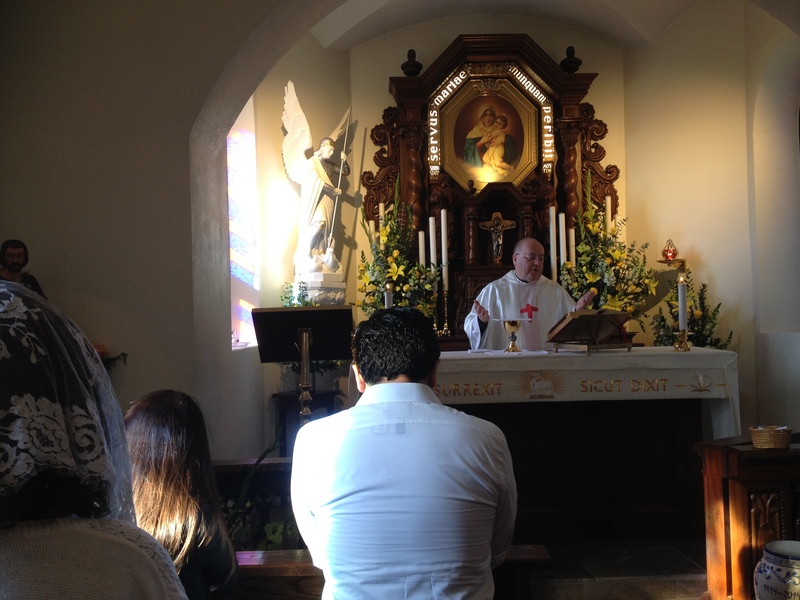 Not only was the community renewing, but also the liturgy! Halfway through the talks, we took the time to pray/sing a Divine Mercy Chaplet together. And later to close, Fr Bryan Cunningham, a Schoenstatt Father, preached a great homily, with some real spiritual gems to take away in the silence of our hearts. I love how liturgy briefly stops time. The rituals, the words, the Sacrament of the Eucharist…it all pulls me into a space that is almost atemporal, or more precisely, a toe-dip into the eternal…and calendars fade, to-do lists half, and my soul finds rest, alongside my brothers and sisters in Christ. As bloggers…who couldn’t use more of this?? Especially more of this that is specifically tuned to purify, renew and sharpen the gift of writing. Quick Take #3 – “The One who sent me.” Fr Bryan’s homily on the gospel that day spoke to me in many ways. I think the most lasting is this – Jesus was always speaking in the name of the Father, in the name of the One Who sent Jesus to the world. And Jesus sends us with the same mission – to love the Father above all else (and our neighbor as ourselves!) and to go out in His name. How often do we truly meditate on that? Do I blog in the name of Jesus? Do I do my best to speak His mercy, love and truth to the world? I’m not sure that I always do. In fact, I’m sure that I don’t always do that! Sometimes, like right now (…ahem)…I’m blogging way too late and not reflecting enough. Fr Bryan’s homily was a wake-up call reminder to put more discernment and reflection towards my posts. And it was also a reminder that all of this is toward the greater glory of God. What a helpful clarifying truth! May we at ATXCatholic continuously strive to grow as Catholic bloggers by first primarily growing in our relationship with God, and seeking to understand His will, and in collaborating with Him, magnify His glory. And may we continue to be open to community with each other, with our readers, with all those to whom we are electronically connected, so that human community and real lasting bonds might leave a deep mark of warmth and connection on the ever-shifting, fast-moving, often inhuman web of new media.